Blinds that are measured incorrectly may not be wide enough for the window. Because manufacturers remove about ½” from the given measurements, it may be difficult or impossible to mount the sides of the windowsill. Instead, they may be mounted on the top of the widowsill. Installation is easy and is similar to outside mount installation. Using the instructions below, you’ll easily be able to install narrow blinds. Mark the ends of headrail on the top of the windowsill after placing and centering the blind with brackets. 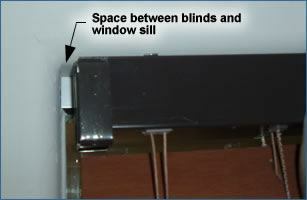 To make sure the headrail will be properly centered, ensure that the distance between the headrail and the side of the windowsill is the same on both side. Install the brackets into the top of the windowsill (not on the side) using the mounting screws. There will be a slight gap between the edge of the bracket and the windowsill. Slide your blinds into the brackets, then close the hinges. Using the provided mounting clips, place the blinds on the bracket. If you don’t like the spaces on the side of the valence, you can re-order a new valence so that it matches the exact width of the window.